Photo via the Boston Public Library Flickr stream. A narrow alley, only six feet wide: hardly the sort of careful, modern road we’d lay downtown today. Once more, we take you back to the environs of Quincy Market, where you can walk the last traces of the city’s original street grid. The ‘Blackstone Block’ is the area sandwiched between Union, Hanover, North and Blackstone Streets. These are some of the city’s oldest routes. Sadly, the city was not laid out laid out along cowpaths. That’s a charming urban myth. The cramped layout owes more to “unscientific” planning and natural obstacles like hills and brooks. Blackstone Street actually lies on top of the old Mill Creek, which was crossed by drawbridges and, you guessed it, powered a mill. 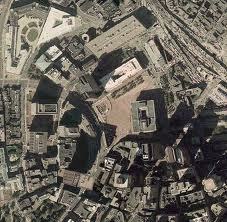 That’s the wide open City Hall Plaza in the center, and the Blackstone area in the bottom right. Author/historian Walter Muir Whitehill once wrote that the Blackstone Block “represented a chronological history of buildings in Boston.” The 17th century streets and alleyways are lined with mostly 18th and 19th century buildings, all built within what was then spitting distance of harbor (land later expanded as real estate grew more valuable than the old docks). The original structures would have been made of wood. The streets were once busy and noisily commercial. The neighborhood’s still home to the famed tourist trap, The Union Oyster House. The Blackstone Block’s restoration was carefully done to suggest just how cramped conditions originally were. Borders of brick and cobblestone outline the original streets and buildings (cobblestones = streets; brick = buildings). This entry was posted in Architecture, Boston, Colonial Boston and tagged Benjamin Franklin, Blackstone Block, North Street, Quincy Market, Union Oyster House, urban renewal, Walter Muir Whitehill. Bookmark the permalink.